In today’s world, there is a self-help book for everything. These books give advice, information, and motivation to improve a specific aspect of one’s life. Addiction recovery is no different. Countless books have been written about how to overcome addiction and how to get one’s life back on track. Below are some of the most popular books available today on the topic of addiction, and a brief description of their content. We chose these books from the many recommended by our Alumni – one is even written by one of our alums. We do not receive any compensation if you choose to follow the link and buy the book. It is only for your convenience. Dr. Harry is the former physician director of The Betty Ford Clinic this classic recovery book reveals a step by step plan to stay sober. With a focus on reclaiming the power that comes from a life free of dependency, Being Sober walks readers through the many phases of addiction and recovery without judgment or the overly “cultish” language of traditional 12-step plans. A Very Fine House is an intimate memoir of a mother’s Norman Rockwell family turned upside down by her daughter’s descent into meth addiction and crime. Bright and beautiful, Annie is an unlikely candidate for meth. Living fast and hard on the streets of Bend, Oregon, she commits crimes against herself, the community, and her own family. 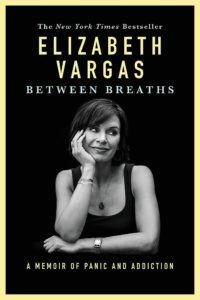 Elizabeth Vargas bravely chronicles her journey from addiction to recovery. In this book, she chronicles her life from an anxiety cursed childhood, a difficult coming of age and the guilt, struggles and denial of a working mom suffering from alcoholism. If You’re Dealing with Alcoholism, this Book is for You. Letting go of the Thief is a ninety-day voyage into alcoholic thinking. Welcome to the chaotic thrashing of a mind, pulsating with intoxication. Spend a few moments in the whirlwind of shame, guilt, and utter desperation. The thief will shrewdly expose the terror of that human soul drenched in remorse and fear. You will never fully understand this harrowing disease until you jump into that circus. One of the top recovery books according to Amazon sales is Codependent No More by Melody Beattie. This book, first published in 1986, covers addiction from the codependent’s perspective, which also carries over to other areas of life. Filled with case studies and real-life examples, many find this book to be very relatable to their situation and it offers advice for taking control of one’s own life. Another book by the same author, The Language of Letting Go, has been a staple in the recovery world since its publication in 1990. In this book, the author incorporates her own life experiences and recovery reflections in a daily meditation book. This collection also deals with codependency and how we struggle with it. 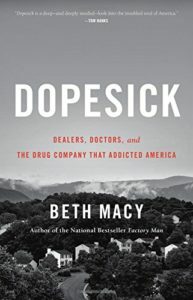 Dopesick by Beth Macy is another big seller in America today. A brand new book, Dopesick covers the opioid crisis from its very beginning to current times. Another self-help style book is Freedom from Our Addictions by Russell Brand. This well-known comedian, writer, and actor gives his personal testimony of addiction and recovery, giving real world advice to those entrenched in the same journey. 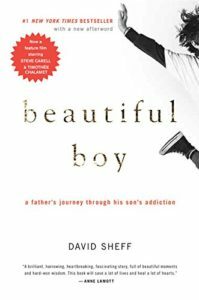 Beautiful Boy by David Sheff is a heart-wrenching memoir about his son’s addiction to meth and the impact it had on the entire family. This author does not merely talk of the struggles, but of the hope that can be found in recovery. 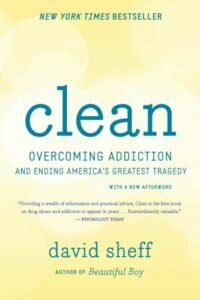 Also by David Sheff, Clean promotes the idea that addiction is a disease and not a moral failing. This book is a guide for those struggling with addiction but also works to create awareness for the overall goal of combating addiction in America and incorporating treatment that is effective. Brian “Head” Welch’s book Save Me from Myself is an honest recounting of this out-of-control musician’s struggle through addiction and recovery. Welch credits his faith in God for saving him from his destructive lifestyle. In this self-help book, Drop the Rock is a guide to adjusting character defects that keep many from recovering. Written by authors Bill P., Todd W., and Sara S., this 2005 book speaks in detail of applying the 12-steps to our lives of recovery. Richard Rohr connects the idea of surrender to God with healing from addiction in Breathing Under Water. Based on the 12-steps, this book addresses the brokenness people feel in all different areas of life. Written by Erica Spiegelman, Rewired is described as a breakthrough approach to fighting addiction. Incorporating the concept of self-actualization, this book encourages the reader to look within themselves for the power for healing. Written by John Dupuy, Integral Recovery works to modernize drug and alcohol treatment using the latest research, techniques, and information. Promoting a holistic recovery, this author provides an informative and researched-based book about why treatment works. Craig Beck writes about his own journey to sobriety in Alcohol Lied to Me. This successful businessman spent 20 years being controlled by his problem drinking, even after trying countless methods to stop. Beck finally discovered his own successful method and promotes it in this book. In the Realm of Hungry Ghosts was written by Gabor Mate and is based on his experience working as a physician of addicted individuals. This author described addiction as a complex interplay between a person’s history, development, chemistry, and the drugs the person uses. The Gifts of Imperfection, written by Brené Brown, is a motivational guide to finding one’s true self in order to achieve true beauty. By cultivating feelings of self-worth, this author promotes whole-person wellness and personal growth. In Recovery from Trauma, Addiction, or Both, author Lisa Najavits focuses on the impact of past trauma on a person’s current addiction. This inspirational book gives real-life examples of how to build coping methods skills and set realistic goals for a healthy life.